Comprehensive and easy to use asset management tools for your business model. Comprehensive, flexible and easy to use, Conquest is a suite of tools to assist your organisation with corporate asset management. Managing valuation and forecasting estimations on your assets is crucial to your asset workflow. Stay ahead of the curve with our extensive valuation and forecasting functionality. Plan for new capital works and upgrades, routine maintenance, purchases and disposals all within the Action Management Centre. Break down actions and projects into sub actions or tasks for scheduling with the assistance of Project Management Software. Designed with ultimate flexibility in mind, Conquest is perfectly adaptable to the needs of any organisation. Your data is our business and out of the box Conquest gives you unparalleled control and flexibility. The needs of each and every organisation are unique and this is where Conquest comes into its own. We’ll help you get the most from your data with custom data structures and advanced querying tools for any purpose. Further organise assets by utilising The Knowledge Base to assign user definable standard asset types to suit your unique infrastructure and asset requirements such as labels, valuation and mapping characteristics, inspection frequencies as well as standard action and defect templates. Use the Asset Register to organise your assets in a hierarchical order, subdividing your infrastructure into components and subcomponents for increased control over assets, actions, tasks and defects. Conquest is a browser based web application that runs on any machine in seconds meaning deployment, upgrades and user management is handled centrally. Your users can access Conquest anywhere in the world on any machine without installing needless software. With years of experience we understand the demands of asset administrators. You want full control over your data, your users and your workflow. Conquest gives you this and more with our comprehensive administration tools. By harnessing the latest in web and mobile technologies, our products move with the rapidly evolving industry to bring you the latest and most sophisticated asset management tools. Conquest is easy to update and even easier to roll out to your users. Conquest’s asset structure was carefully designed so that integration with other information systems such as financial, GIS or project management is a straightforward process. 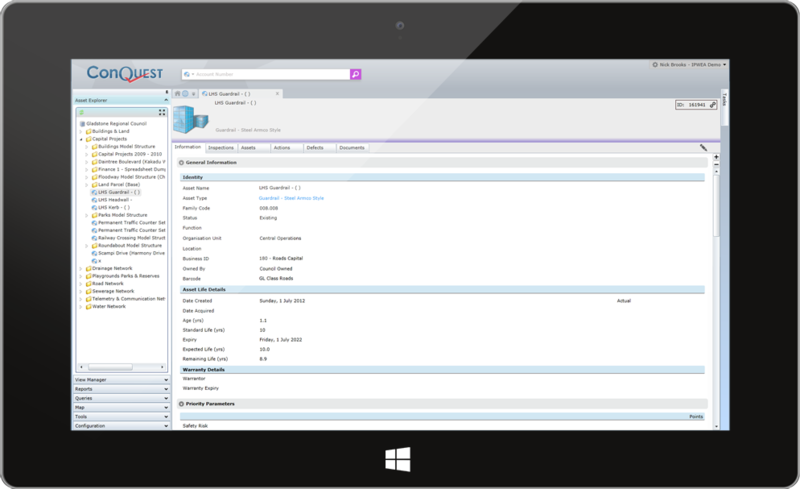 Your users will love the unrivalled simplicity, ingenuity and flexibility of our user interface. Use our extensive inspection tool set to quickly and efficiently carry out your inspection programs. 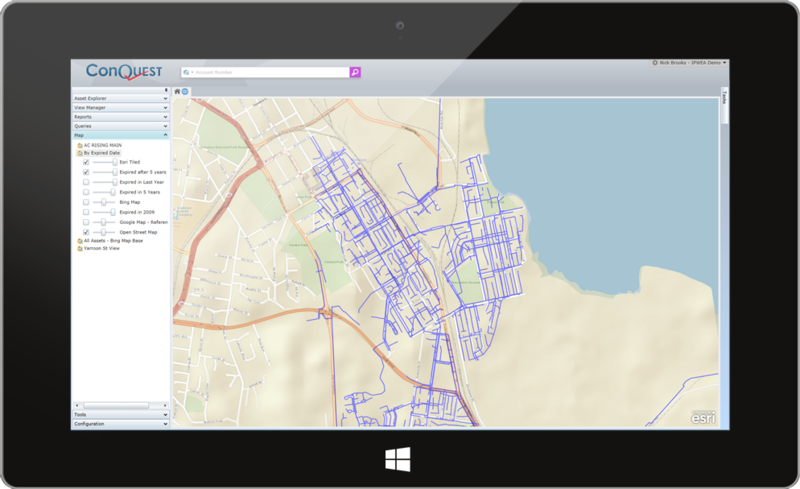 Map your Conquest data quickly and beautifully to visualise your geospatial data in the office or abroad. Configure your workflow the way you like with Conquest favourites – consistent on any device you access. Conquest’s technology is encapsulated by a beautiful interface. Modern, sleek and ready for the web. Our mobile products run as well offline as they do online. Data is stored locally and synced when back in range. Built from the ground up as an entirely corporate cloud solution, access crucial data anywhere in the world! Store, collaborate and share documents within your team with our seamless document management system. 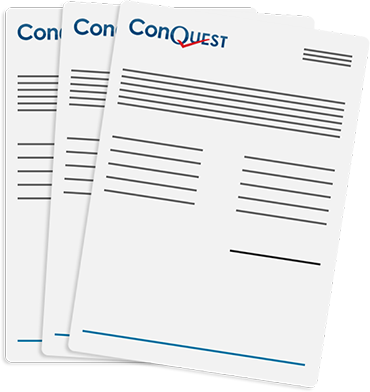 Conquest can be endlessly configured with powerful extensions to make your life just that little bit easier. Conquest’s comprehensive suite of reporting tools allow for both simple and complex reporting using set criteria for your data. Use one of our many standard reports or completely customise your own to query data and meet essential reporting needs. Conquest’s extensive standard reporting templates simplify the process of extrapolating relevant data for instant use. Whether fetching raw data or using a printable report template, there’s no need to deal with unnecessary queries. If standard reporting templates aren’t quite right for the job, you can build your own completely customised template from the ground up using our flexible report builder. No report is too complex.